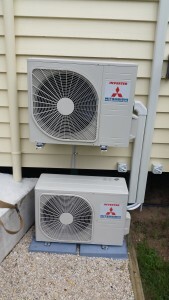 We do the installation of a variety of Air Conditioners in the Hervey Bay, Maryborough and surrounding areas. We keep you cool in summer and warm in winter with a range of air conditioning systems including the installation of Split System Air Conditioners. Astra Electrical will ensure your air conditioning system is installed correctly and operating at peak performance. We also do the servicing of your air conditioner to make sure your system works efficiently and has clean filters and condensers to ensure your well-being and save you money.